In 1847, John Sutter was busy establishing himself as a land baron in California. Sutter hired a man named James Marshall to build a saw mill on his property near Coloma. During the construction project, Marshall found a shiny nugget in the stream where the saw mill was to be built. He didn't think too much about it (he had a saw mill to build), but the news of his discovery swept across country. There's gold in them thar' hills! The California Gold Rush of 1949 became the greatest migration of people in our history. One sleepy little village grew from about 1000 people in 1848 to more than 20,000 people by 1850! (That little village is San Francisco). People totally abandoned their lives back east to get their piece of the golden rock in California. Opportunity doesn’t knock but once. When you find something of incredible valuable, then you give up everything else in order to make it your own. Jesus told a little story that sounds a lot like that. It’s also about a great treasure, this one buried in the ground rather than in a stream in California. It’s a story, frankly, that bothers me. A lot. It was fairly common in Bible times for people hide valuables in jars buried in the ground. According to Barclay, an old Rabbinic proverb stated that, “The only safe place for money is the earth.” And that is likely the background of the parable. People buried their treasure during times of danger (outbreaks of robbers or perilous political times) and would retrieve them when the danger was over. But what if the danger never was over? What if the treasurer owner died? What if he simply forgot where he left the treasure? Finders keepers! Jesus’ parable is of a man who comes across such a treasure hidden in a field. He puts it back where he found it and then immediately sells everything he owns so that he can buy the field (and the treasure). Treasure is so valuable that he is willing to sell everything to have it! Well, that raises some pretty interesting ethical questions, doesn’t it? Is it really ethical to buy a field like this? Should he not have tried to find the owner? Those aren’t the point of the story. And this also isn't my problem with the parable. The point of the story is that if we recognize the kingdom of God for the treasure it is then we will joyfully give up all that we have in order to possess the treasure. All of the treasures of this earth pale into insignificance compared to treasures of the kingdom of God. And THIS is my problem with the parable. Not a problem with the interpretation of the parable; a problem with its application. I’m not sure I’m very good at joyfully giving up the things of earth to more firmly gain a hold on the kingdom of God. I think I spend too much time trying to juggle two different sets of treasure. I can’t really hold onto both… so I juggle. I spend some time trying to keep up the bowling pins or spinning plates of the world... and then I steal some time for the things of the kingdom. Maybe I can't grasp fully the kingdom of God because so much of the time my hands are full of the things of this world. The guy in Jesus' story gave up everything to possess the treasure that was truly treasure. May God give me the grace to let drop the things of this earth so that I can take a firmer hold on the kingdom of God. How about you? 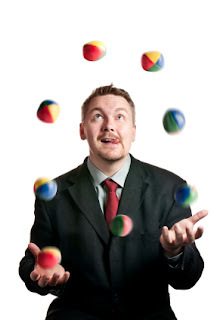 Are you a juggler too?